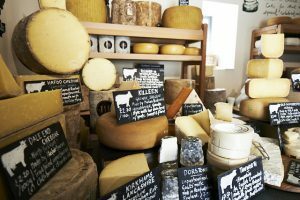 Home Learn About Cheese Cheese Musings & Tips Blue cheese – what is the blue mould, and how does it come about? ‘Blue cheese’ encompasses a broad spectrum of cheese, running from creamy to crumbly, mild to powerful, sheep’s to cows’, but all characterised by the growth of blue mould and veining in air spaces inside the cheese, which gives it quite a distinctive and full flavour. The most famous blue cheeses (‘the big three’) are probably Stilton, Roquefort and Gorgonzola. But how does that blue veining come about – is it mould? Well, yes it is, and it’s the mould that makes the cheese taste delicious! It is true that generally we are averse to allow mould on food because it indicates the food is not fresh, although many moulds simply taste unpleasant yet are not problematic to our health. As moulds grow on a food, however, they change the appearance, flavour, texture and aroma of the food. 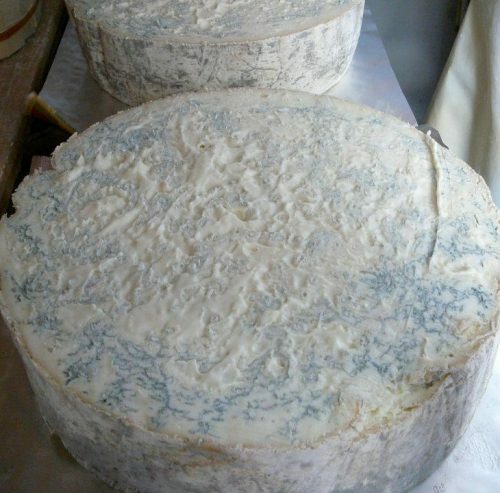 The blue mould seen on and in cheese does exactly that, and it has normally been specially added by cheese-makers in order to help the cheese ‘break down’ and enhance the flavour (‘internally’-ripening the cheese). The blue (and white) moulds are different strains of the penicillin genus (there are 600 strains of penicillin – the common antibiotic). Incidentally, penicillin gets its name from the Latin word for paintbrush ‘penicullus‘ because under a microscope the mould looks rather like paintbrushes. Penicillium roqueforti strain has been specifically chosen for cheese because it adds flavour. These penicillin moulds are completely harmless in cheese making because the moulds that grow on cheese do not produce the same mycotoxins that can be produced on other foods. With cheese-making, it’s the combination of acidity, salinity, moisture, density, temperature and oxygen flow that creates an environment completely unsuitable for the production of toxins. As the blue veins develop they enhance the flavour of the cheese. Penicillium roqueforti itself (and the enzymes it releases) aggressively breaks down the fat and protein in the cheese to give the texture, flavour and aroma associated with blue cheese: sharp, strong and piquant. It raises the pH (acidity) of the cheese helping with texture and flavour. The mould is highly proteolytic (it easily breaks down proteins). This happens naturally in any cheese, but blue mould accelerates the process. This helps to break down the cheese texture to be softer/ creamier (the eventual protein breakdown to ammonia is also why these cheeses can be ammoniated). The strong lipolytic (breakdown of fats) action of the mould breaks down the fats, giving lots of free fatty acids (ketones) which give the piquant flavour and aroma unique to blue cheese. So how did blue cheeses first come about? Legend says a French shepherd left his cheese in a cave (perhaps to chase after a lovely lady) and when he returned later a mould had formed, creating a truly delicious cheese. Like many French cheese stories this is a bit fanciful, but it is historically obvious that blue cheese would have developed from accidents caused by natural blueing in the right environment. Blue mould is abundant in the air, grows rapidly and in proper conditions out-competes most other foreign moulds (think – it even grows on your lemons at home!) It loves humid, damp environments with a good air-flow (plenty of oxygen). Many ancient limestone caves, barns and cellars, where cheese was often stored, would have provided the ideal environment for it to grow. Some naturally blue cheeses would have been earthy and wasted, but some were found to possess a rather special texture and flavour. This became sought-after, creating demand for this rather special type of cheese. The natural blueing of yesteryear was aided by the fact that cheeses of that day had a more open texture (air spaces, so the mould can form), a moister acid-curd (before the introduction of efficient pressing and use of starter bacteria), and less uniform rinds (so mould could get in). 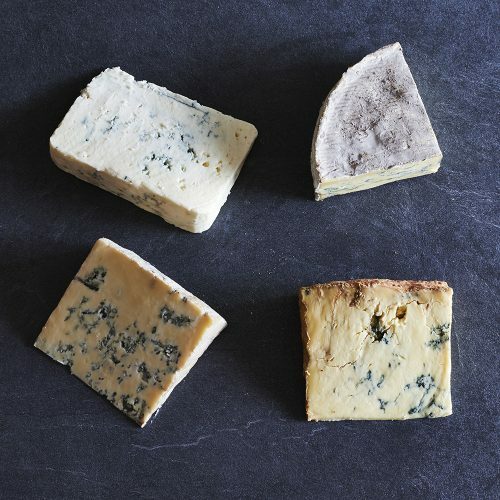 These cheeses with open textures and weak friable bodies, like Wensleydale and Cheshire, were and are particularly susceptible to blueing (naturally blue Cheshire and Wensleydale were once very sought-after cheeses). Although blueing was not ‘controlled’, over the years dairies in the midlands, north of England and central region of France, evolved methods to give them good results to make blue-veined cheese. (Even up until recently Roquefort makers would culture their blue mould on locally made rye bread before drying it and crumbling it up into the curd). In far-past days the cheeses were matured for a long time to get good blueing. But this changed as science progressed (1940s onwards) – the specific strains of Penicillium roqueforti moulds that produced the best flavours could be selected, refined and cultured by dairy scientists for use in producing ‘blue’ cheese. This meant they could inoculate the milk with specific blue cheese moulds to make more-consistent cheese with specific flavour profiles. Making a blue cheese in the modern day – how to make a blue cheese ‘blue’! Scie ntists continue to develop and grow different strains of Penicillium roqueforti (and other moulds and bacteria) in their labs to produce specific flavours. 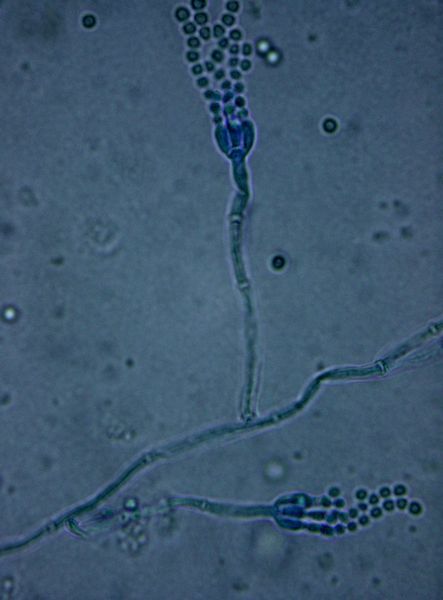 Nowadays most cheese-makers will add these pre-grown mould spores in a powder form, which they buy in specially. This will inoculate milk at the beginning of cheese making (in the same way as dried yeast is added to bread dough). This ‘forced’ blueing from pre-packet mould develops fast and benefits from the mould been refined to produce good blue colour and veining (though some argue the slow maturing natural blues provide a better flavour). The cheeses are often made with open textures (plenty of air-holes) in order for the blue to spread. There are various methods to achieve this, such as ‘over-drying’ the surface of cut curd particles during the cheese making so they don’t knit together as much, and generally not pressing blue cheeses to allow the gaps between curds to form. Sometimes bacterial cultures such as leuconostoc are also added as these help to form the open texture by producing gas holes in the curd. Sheep’s milk naturally has a higher proportion of this – perhaps explaining why it’s commonly used to make blue cheeses (e.g. Roquefort). The blue mould added at the beginning of the cheese-making remains been dormant whilst the conditions have not been right for it to grow, but once the cheese curd has been ‘moulded’ the conditions become perfect. All the mould needs now is oxygen (air). So after a short time (often 4-10 days after moulding in continental styles) the cheese is pierced to allow the air in. Some blue cheeses have open rinds that allow air in naturally – these don’t need to be pierced – but the majority use piercing as a method of control; otherwise some parts may over blue, whilst others do not get enough air. The cheese is pierced with stainless steel needles (gone are the days of copper, which was used in the past because it was the easiest thing to clean). The air holes created by piercing (or ‘needling’) allow oxygen to get inside the cheese, allowing the blue to develop properly. Often in a cut blue cheese the distinct linear paths of blue where the needle has pierced the cheese can be seen; it even be possible to see the hole on the outside of the cheese where the needle went in. The size and quantity of needles and the amount of piercing will determine whether the cheese will be more or less oxygenated, and therefore the amount of blueing. Some cheeses (e.g. Stilton) may have their rind rubbed over to prevent any holes from allowing air in. This means the cheese can then be pierced at a later date (often 8+ weeks), allowing the cheese to mature before blueing and helping control the blue development (over-development can lead to the cheese becoming too ammoniated and sharp). 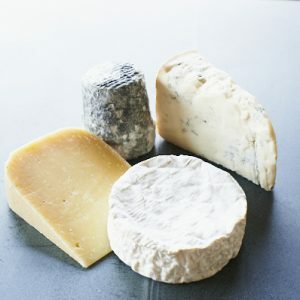 In order to control the development of blue Penicillium roqueforti mould in continental style cheeses, which are pierced earlier, they are often wrapped in foil once the cheese has blued sufficiently, to prevent further oxygen getting in, and then moved to a lower temperature. This will help to stop further development of blue mould but breakdown of fats can continue. Most modern-day blue cheeses have developed fully and are ready to sell at 2-3 months old. Why are blue cheeses often saltier? There are several reasons for this: extra salt helps restrain the blue mould so that it doesn’t over blue, by lowering the micro-organism activity and the ripening speed – the salt helps favour lipolysis instead of proteolysis, to get specific flavours. The end result, therefore, will be less ammoniated, with less bitter flavours. It also helps conserve the cheese and balance the bitter flavours to produce a tastier cheese! A good cheese-maker can use slightly less salt if they can control the blue mould through other means such as slower maturation or less piercing; this helps produce a more rounded flavour. Blue cheeses should have a balanced flavour – too often nowadays they are very aggressively blue, with lots of veining, so that they look ‘blue’ on the counter or in the pre-pack. With this level of aggressive blueing they can often be too strong, sharp and bitter – and one-dimensional in flavour, with lots of salt used to balance/control. A good blue cheese should be balanced, with a variety of other flavours to complement the blue flavour. Blue cheese – it’s an epicure’s delight. Fancy trying some interesting and different blue cheeses? Why not check out The Courtyard Dairy’s blue cheese box – click here. Stichelton Cheese – the usurped king of blues? The story of Humprhey Errington and how Lanark Blue came to be, and their trials and tribulations along the way!